Of all the vocal group recordings of the '40s and '50s, only one Rhythm and Blues song is known by almost all popular music listeners: the Penguins' "Earth Angel." 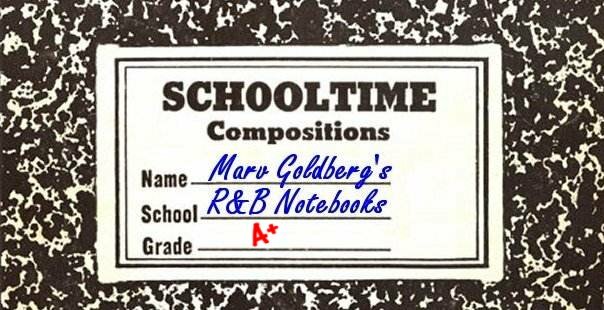 This monster crossover hit went a long way towards introducing R&B sounds to white audiences. While the group was unable to follow it up with another hit of that magnitude, they nevertheless turned out around 50 more sides, a very respectable output. This is their story. The Penguins' roots can be traced back to early 1950s Los Angeles. Of course, most large cities with substantial black populations were hotbeds of R&B group singing, and L.A. was no exception. 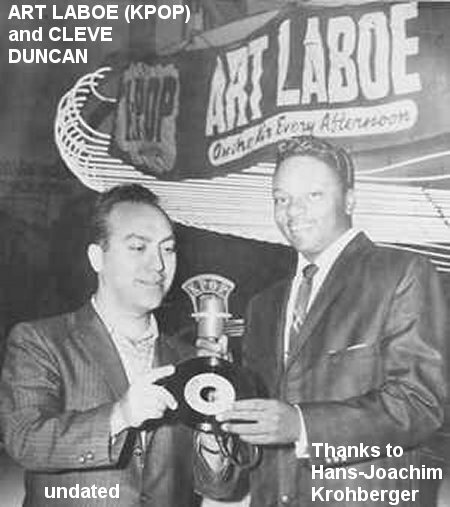 One evening, in late 1953, friends Cleveland Duncan (tenor) and Curtis Williams (baritone/bass) bumped into each other at one of Los Angeles' many talent shows (this one at the California Club). They had gone to grammar school together, but hadn't seen each other in some years. 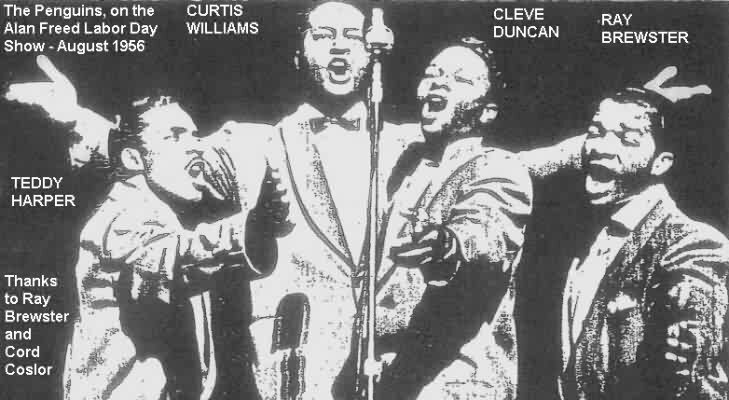 At the time, Curtis was a member of the Hollywood Flames, a Los Angeles group that had seemingly been around forever (he was on the Flames' Aladdin, 7-11, Swing Time, and Lucky releases). Curtis had a song, "Earth Angel," which he was working on with Gaynel Hodge (another member of the Flames), and asked Cleve to help him with the arrangement. When I interviewed Bobby Day, bass lead of the Hollywood Flames (under his real name of Bobby Byrd), he remembered Curtis working on "Earth Angel." 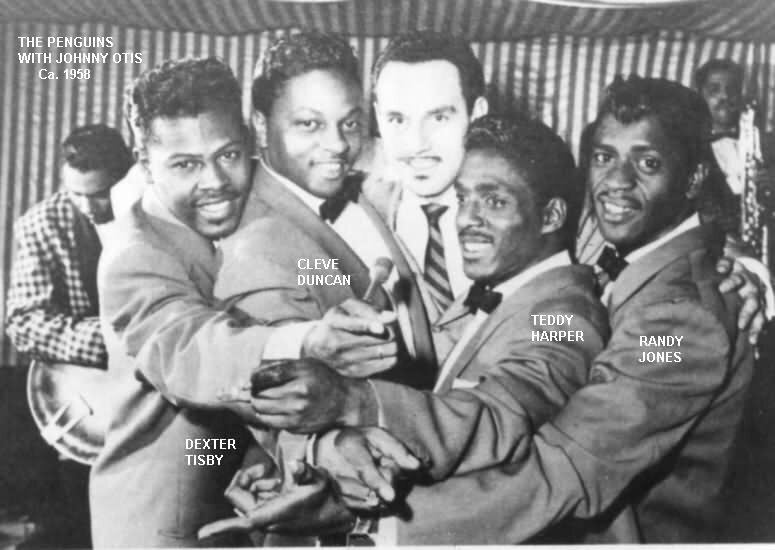 When Curtis was thrown out of the Hollywood Flames (for being "too independent," according to Gaynel Hodge), he and Cleve decided that Los Angeles could use yet another vocal group and each of them brought in a friend: Cleve got tenor Dexter Tisby (whom he had known from Fremont High), and Curtis got baritone Bruce Tate (both of them had attended Jefferson High). Then came the hard part: coming up with a name! One of the members smoked Kool cigarettes, which, at the time, had "Willie the Penguin" as its cartoon advertising character. Therefore, because they considered themselves "cool," they decided on "the Penguins." 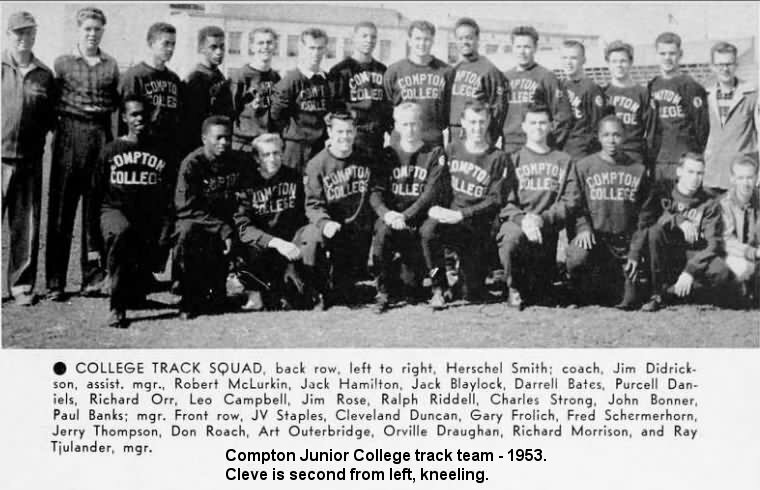 At the time, Cleve (born July 23, 1934) was attending Compton Junior College. Although he's "Cleveland Duncan, Junior" in the 1940 census, I can find no reliable trace of his father (he's living with his mother, Anna Richey Duncan). Note that he was born in Los Angeles, not Cleveland. 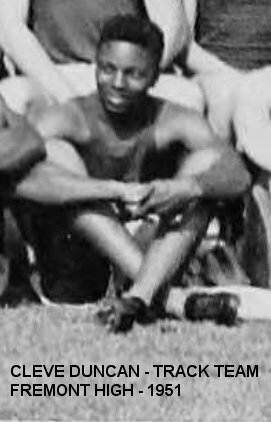 He'd been in the Fremont High band (saxophone) and the track team (he still went out for track in Compton J.C.). Bruce Tate came from Texas originally. They were all around 19 in 1953. 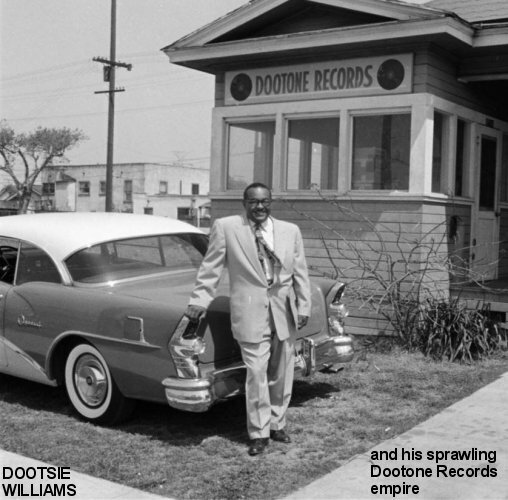 In the Spring of 1954, they recorded two demos for Walter "Dootsie" Williams, owner of Dootone records: "No There Ain't No News Today" (with Cleve in the lead) and "I Ain't Gonna Cry" (fronted by Dexter). Dootsie had also been a bandleader, fronting the house band for the Harlem Club in Los Angeles. 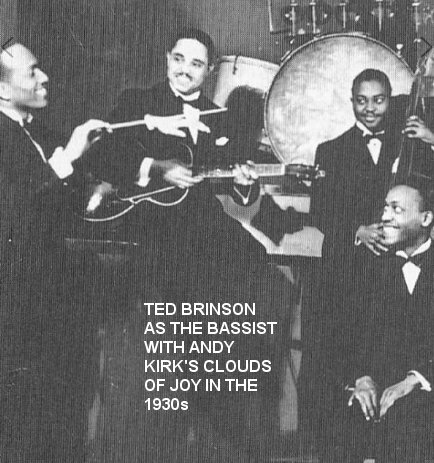 Cleve had a relative named Ted Brinson, a former bass player for the Jimmie Lunceford Orchestra. Brinson had built a recording studio in his garage (with a single-track Ampex tape recorder), and this was used by Dootsie for his sessions. Naturally Brinson had suggested to Cleve that they audition for Dootsie. Aside from liking the Penguins' sound, Dootsie liked the fact that members of the group could write their own songs; that way he could publish them and make even more money off the group. In May of 1954, the first Penguins release was issued: "No There Ain't No News Today." (Strangely, the Penguins were put on only one side of the record, which had as its flip "When I Am Gone," by Dootsie Williams & his Orchestra, vocal by Willie Headen). It took the trade papers until August to review the record. The other demo, "I Ain't Gonna Cry," was later released on a Dootone EP in May 1955. Actually, Cleve was unhappy that Dootsie released either of these songs, which were just thrown together with no intent of having them released in that form. They then did a session to record the street song "Hey Senorita" (led by Curtis) and the classic "Earth Angel" (with Cleve in the lead, Dexter on second bridge, and Curtis doing the piano intro). When the record was released, in September of 1954, it was "Hey Senorita" that was given all the airplay initially, and it started doing well. However, sometime in October, DJs started flipping it over, and "Earth Angel" started (slowly) climbing the charts. (Cleve gives credit to Charles Trammel, of KFOX, whose show was broadcast from L.A.'s 5-4 Ballroom.) Note that Dootsie Williams assigned master numbers at pressing time, which means that there's no reliable way to know which songs were recorded at which sessions. Meanwhile, with "Earth Angel" only making some mild noise, they did another session, recording four additional tunes: "Love Will Make Your Mind Go Wild" (Cleve and Dexter), "Ookey Ook" (Curtis), "Baby Let's Make Some Love" (Dexter), and "Kiss A Fool Goodbye" (Curtis). On October 2, they appeared at Johnny Otis' annual "Hep Cat Ball" at L.A.'s Shrine Auditorium. Also on the bill were the barely-known Platters, Richard Berry & the Dreamers, the Medallions, Marvin & Johnny, and the Chuck Higgins orchestra. Also on October 2, "Earth Angel" first hit the Los Angeles regional charts, debuting at #4. "Earth Angel" was reviewed in the trades the week of October 16, 1954, along with Charlie & Ray's "I Love You Madly," Richard Berry's "The Big Break," the Jewels' "A Fool In Paradise," Lee Andrews & Hearts' "The Bells Of St. Mary's," the Bees' "Toy Bell" and the 5 Keys' "Ling Ting Tong." On October 29, they appeared in a package show with Roy Milton, Shirley Gunter & the Queens, Mickey Champion, and the Flairs. This tour started in Santa Barbara and played San Pedro, El Paso, Tuscon and Phoenix. By mid-November, "Earth Angel" was taking off on the West Coast (#1 in Los Angeles), New York City, Philadelphia, Cleveland and Nashville. Sid Talmadge, of Record Merchandising, was one who actively pushed the record (he was subsequently given a lot of credit for making the song a hit). On November 27, they headlined a show at Glendale's Civic Auditorium. Also on the bill were the Cheers, Earl Curry & the Blenders, and the Chuck Higgins orchestra. As soon as "Earth Angel" started heading up the charts, the cover versions were released (by the Crew Cuts on Mercury, Les Baxter & the Bombers on Capitol, Pat O'Day on MGM, Gloria Mann on Sound, and the Blue Jays [the Squires] on the "el cheapo" Dig This Record label). As was the case in those days, the white cover version outsold the original. However, the Penguins made a very respectable showing: whereas the Crew Cuts made it to #3 on the Pop charts, the Penguins weren't far behind, at #8 (the Crew Cuts' version hit the charts about a month after the Penguins'). More important, the Penguins reached #1 on the Rhythm And Blues charts, and today the Crew Cuts' version is looked upon as nothing more than a cute curiosity. 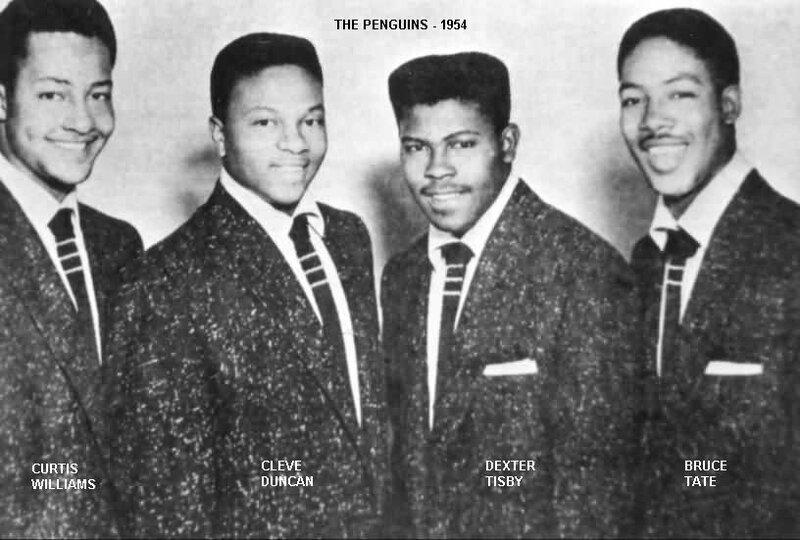 (The Penguins entered the national R&B charts on 12/8/54, and remained on them for 17 weeks — until mid-March of 1955.) 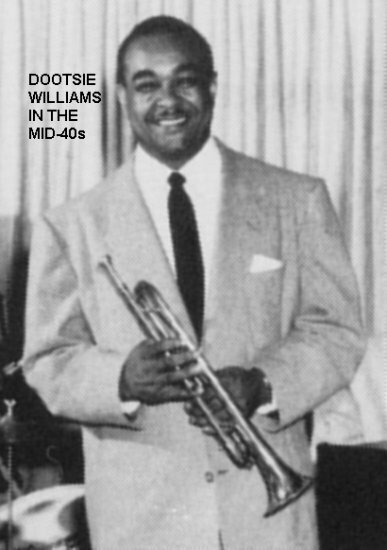 Dootsie Williams would call "Earth Angel" his only "natural" hit (a record that, without promotion, and with just a little airplay, snowballs into a hit almost by itself). December 10 found them at the Valley Ballroom in San Bernardino along with the Duke Coleman band. On December 20, they played L.A.'s Embassy Auditorium along with the ubiquitous Chuck Higgins. On New Year's Day 1955, they opened at Washington, D.C.'s Howard Theater. Finally, in January, "Earth Angel" started charting in the South. As with most groups, the Penguins felt they weren't getting their fair share of royalties. 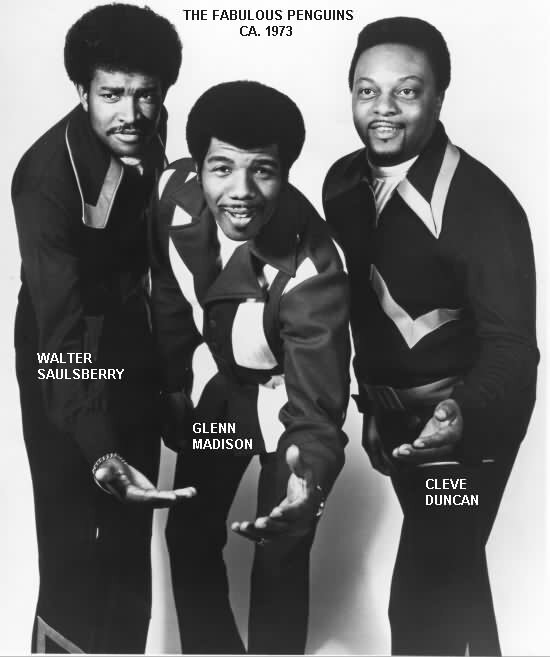 They saw "Earth Angel" becoming a big local R&B hit, and it seemed likely to climb the national charts as well. Still, they couldn't get any advances from Dootone. By the time it hit #5 on the R&B charts, they were constantly asking for advances and being turned down. They grumbled, and when approached by Buck Ram, manager of another local L.A. group, the Platters, they acted impetuously and went off with him. (Since Curtis was the songwriter, Ram approached him first; later he spoke to the others.) 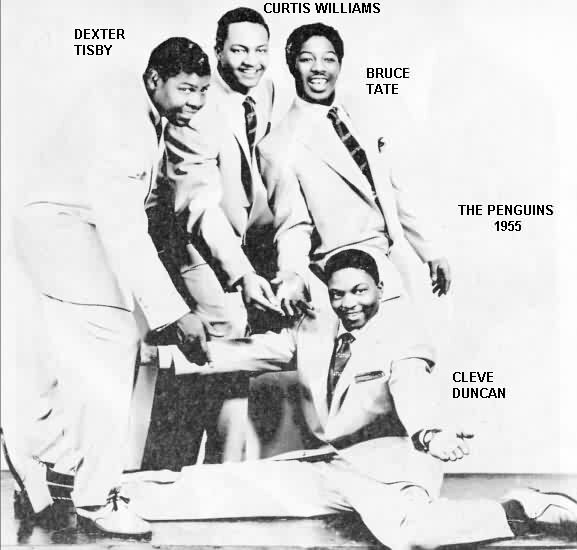 Ram issued a press release on January 15, 1955 saying that "Curtis Williams and the Penguins", who had just signed with him, were at the Apollo Theater in New York introducing their new song and dance, "Ookie Ook" [sic]. It also stated that they'd just been signed by Mercury Records "to a fabulous contract". Since the Penguins had a chart hit (still climbing), it wasn't hard for Ram to do some wheeling and dealing. He went to Mercury Records (home of the Crew Cuts), which expressed immediate interest in the Penguins. 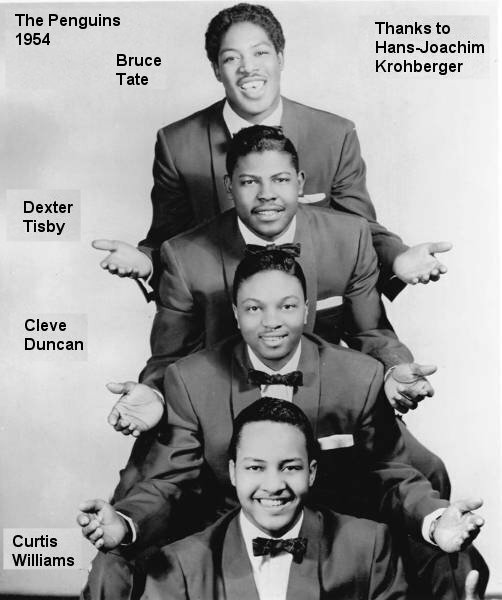 However, Ram had his own ideas, and talked Mercury's Bob Shad into also signing the Platters, a relatively unknown group with some average-sounding R&B records to their credit. Mercury reluctantly assented, and the Penguins wound up with a Mercury contract. This all took place in a very short time frame: "Earth Angel" hit both the national R&B and Pop charts on December 25, 1954; their first Mercury session was held on February 1, 1955. The contracts were held up until April, pending court approval, because three of the Penguins were still underage. Papers, always behind the curve, reported on February 26 that the Penguins' contract was being "offered around for three grand." 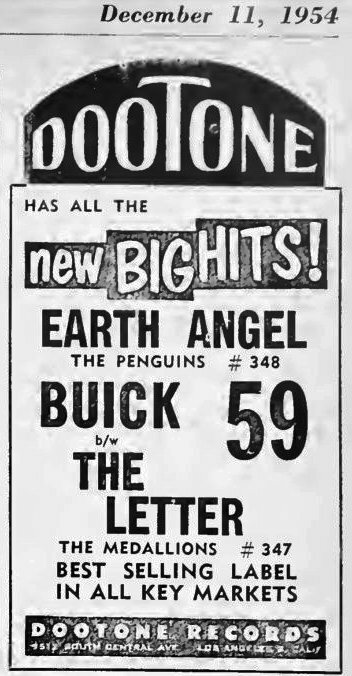 Since the Penguins played the Apollo Theater the week of January 14, 1955, and had to drive there and back, I imagine that most of the interaction with Dootsie was carried on by Buck Ram. By the time they returned from New York, it was a done deal. Others on the Apollo show were Dinah Washington and James Moody. Dootsie warned the Penguins that by breaking their contract with him, they would lose all royalties for the Dootone release of "Earth Angel." Their answer was "To hell with your royalties; we're gonna make it big." Although they lost out, who knows how much they lost? No 50s R&B act got rich from royalties; they might have gotten nothing much out of it anyway. 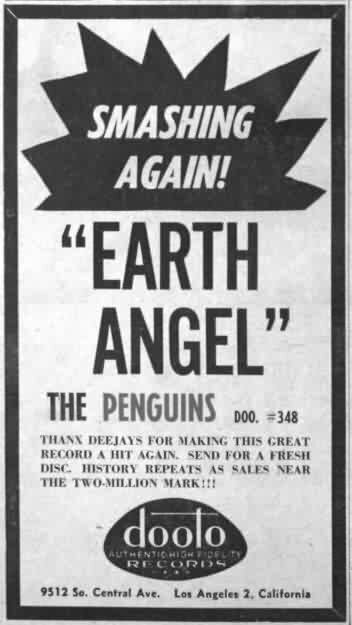 On the Penguins' first Mercury session (2/1/55) they re-recorded four of their Dootone releases: "Earth Angel," "Ookey Ook," "Love Will Make Your Mind Go Wild," and "Hey Senorita." Almost note-for-note copies of the Dootone versions, they were never released by Mercury, due to the ongoing lawsuits. The very next night the Penguins appeared on the Perry Como TV show. Ram's machinations paid off, although the Penguins got hurt. On Mercury, the Platters clicked with their first release, "Only You," and the Penguins were left behind in the dust. Both Ram and Mercury concentrated on the Platters, and even though the Penguins were doing some of their best work, there was no direction for them. Worse, under Ram's tutelage, they lost control over the production of their songs. The consolations were two: Buchanan and Goodman's 1956 "Flying Saucer" revived interest in "Earth Angel" (which the Penguins re-cut a second time for Mercury), and, at least Mercury gave them advances. It's entirely possible that Ram knew all along that the Platters were the ones he'd push and that the Penguins would have to fend for themselves. He wrote many songs for the Platters, but only two ("Dealer Of Dreams" and "A Christmas Prayer") for the Penguins. On top of that, the Penguins resisted, probably unwisely, the discipline that Ram imposed on the Platters. As Cleve told it, "we were young and didn't really want to spend that much time practicing." Also, Ram tried to "improve" their sound, by making them a Pop group. However, Cleve didn't have a feel for it; it just wasn't natural for him. On March 10, 1955, they had their second session for Mercury, recording "Don't Do It" (Dexter), "It Only Happens With You" (Cleve), "Walkin' Down Broadway" (Bruce), and "Be Mine Or Be A Fool" (Cleve and Dexter). The first Mercury record was "Be Mine Or Be A Fool"/"Don't Do It," issued in April. The tunes were reviewed the week of April 30, along with the Aladdins' "Remember," the Inspirators' "If Loving You Is Wrong," the Marigolds' "Rollin' Stone," the Dominoes' "Love Me Now Or Let Me Go," and the Feathers' "Why Don't You Write Me." Also in April, Dootsie released their last Dootone record: "Kiss A Fool Goodbye"/"Baby Let's Make Some Love." Meant to compete with "Be Mine Or Be A Fool" (now there were two "fool" records out by the Penguins), it was reviewed the week of May 14th, along with the 5 Keys' "The Verdict," the Jacks' "Why Don't You Write Me," Big Boy Groves' "I Gotta New Car," the Cashmeres' "Don't Let It Happen Again," and the 5 Dukes' "I Cross My Fingers." 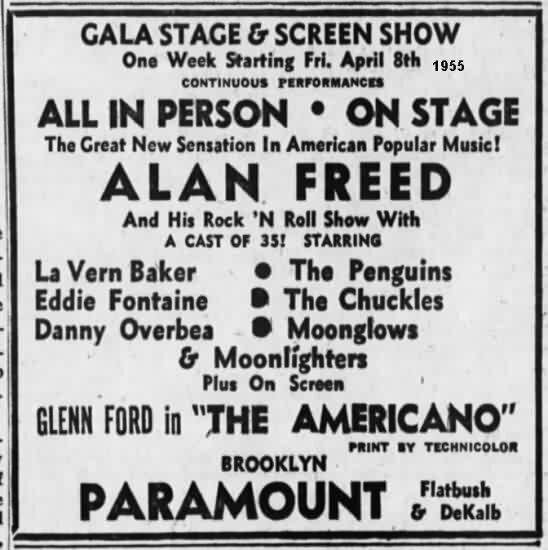 On the strength of "Earth Angel," Buck Ram got them on Alan Freed's Easter Show at the Brooklyn Paramount, which ran for a week, beginning on April 12. While driving to New York, they passed through Hatch, New Mexico. It was here that Bruce Tate cracked completely and couldn't continue on; Dexter says that he simply couldn't handle the pressure of having a hit record. The guys phoned Ram, who searched around for a replacement and came up with bass Randy Jones, who had been with the Meadowlarks. Jones was sent to meet them in New York. Since Curtis was really a baritone, he was happy to let Randy handle the bass chores. 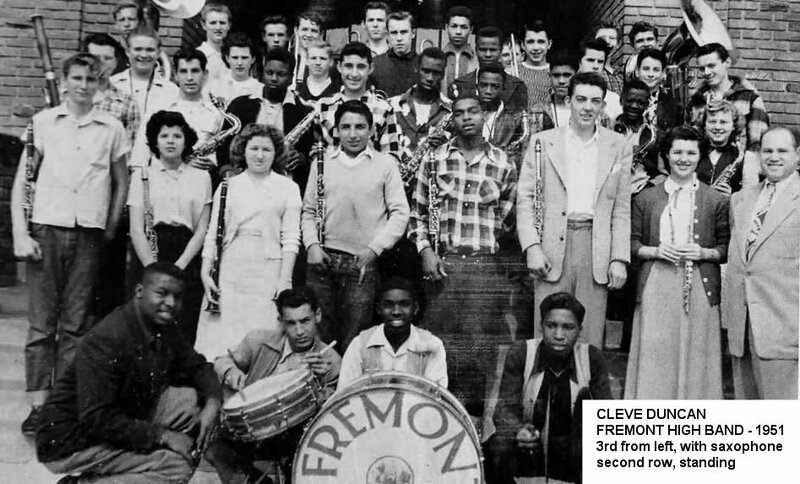 Also on the bill at the Freed show were the Clovers, the Moonglows, Lavern Baker, Danny Overbea, and the 3 Chuckles. This show broke a house record that had been set by Russ Colombo in 1932. Then the legal battles began. On April 30, Curtis Williams sued Dootsie, Dootone, and several others for $110,000 and the return of the rights to "Earth Angel," "Hey Senorita," and "Love Will Make Your Mind Go Wild." He also charged fraud and sought to have his contract with Dootone voided on the grounds that he had disaffirmed it on December 15, 1954, because he was a minor. He also wanted the return of all of the copyrights for "Earth Angel." Since there were several other versions of "Earth Angel" around, there was a lot of money to be made off the song (mostly for lawyers, I imagine). Then, on May 6, Dootsie sued Mercury and Buck Ram for $750,000 in damages (an even million was reported by the Pittsburgh Courier), charging that they induced the Penguins to break their Dootone contract. In the same week, Jesse Belvin and Carl Green (a singer/pianist and the first "Johnny" in Marvin & Johnny) sued Dootsie, claiming authorship of "Earth Angel" (Belvin) and "Hey Senorita" (Green), and a share of royalties. It would take two years to work all this out (we'll see how, later). 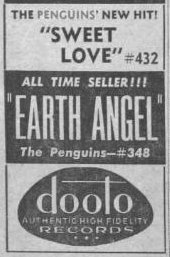 Buck Ram, of course, wanted to take the Penguins completely away from Dootsie, including the publishing rights to "Earth Angel"; the lawsuit was really only about the rights to the song. The whole "Earth Angel" arrangement bears a passing resemblance to Jesse Belvin's composition, "Dream Girl." Belvin, who turned out songs faster than most people could sing them, seems to have been the originator of the tune (along with Curtis Williams and Gaynel Hodge). The Hollywood Flames (with Curtis and Gaynel) seem to have practiced the song for a while, but never got around to recording it. When Curtis left them to go to the Penguins, he took the song with him. (There was no hint of "stealing" in an atmosphere like that; singers helped each other and freely exchanged material. Cleve actually made some changes to it also, so it would fit his style and range.) This time was a bit different, though. Jesse had just been discharged from the Army; he was married and broke and the Penguins had a hit with "his" song. However, since he had never said a word about it before the lawsuits began, it's probable that Dootsie talked him into it (a lawsuit was completely out of character for Belvin). Cleve was never called to testify, and Curtis had to go once or twice. In spite of all of this (or maybe because of it; publicity is always good for sales), Dootone issued an EP in May containing "Earth Angel," "I Ain't Gonna Cry No More" (one of their original 1954 demos), "Love Will Make Your Mind Go Wild," and "Baby Let's Make Some Love." On May 14th, they appeared with Alan Freed and Hal Jackson at a "Command Performance Concert" at Detroit's Olympia Arena (a benefit show to fight juvenile delinquency). Also on the bill were Jimmy Ricks & the Ravens, the Charms, Dinah Washington, Ella Fitzgerald, Lionel Hampton, Erroll Garner, Betty Madigan, Lester Young, Clara Ward, Mahalia Jackson, Wild Bill Davis, Count Basie, and Al Hibbler. Also in May, Dootsie received a gold record for "Earth Angel." So did Sid Talmadge of Record Merchandising, for breaking the tune. The Penguins weren't even invited! "It Only Happens With You"/"Walkin' Down Broadway" was the next Mercury pairing, released in June. On July 7, the Penguins and Percy Mayfield appeared at L.A.'s 5-4 Ballroom. In early August they did a short tour of the Northwest with Big Boy Groves. They got back in time to record four more sides for Mercury on August 26th: "My Troubles Are Not At An End" (Curtis), "Devil That I See" (Dexter and Cleve), "Promises, Promises, Promises" (Dexter), and "She's Gone, Gone" (Curtis). "Devil" and "Promises" were issued a few days later and were reviewed the week of September 24th along with the Dreamers' "Tears In My Eyes," the Striders' "Hesitating Fool," the Counts' "I Need You Tonight," the Sparks Of Rhythm's "Don't Love You Anymore" (with Jimmy Jones on lead), the Calvanes' "Don't Take Your Love From Me," and the Keynotes' "Suddenly." September 17 found them at the Valley Ballroom in San Bernardino (singing "Earth Angel" and "Don't Do It", as well as "Other Rhythm And Blues Songs"). Music was provided by Gil Bernal's Orchestra. At the end of September 1955, the Penguins played the Moulin Rouge in Las Vegas for a week, along with Les Brown And His Band Of Renown. They then rushed back to Los Angeles for another Mercury session (on November 12th) at which they recorded two Christmas songs: "A Christmas Prayer" (Cleve) and "Jingle Jangle" (Curtis), which were released that same month. Troubles. Dexter said that the Penguins had a green 1955 Pontiac station wagon, and instead of taking theirs, Bruce, for some reason, stole a different, but similar, auto. (I originally had the year wrong on this, placing it in November 1954. Now, Bruce was no longer with the group, so I'm not sure if he was trying to steal the Penguins' car or if that was coincidental and had nothing to do with the incident.) He was driving the stolen car on Central Avenue, the night before Thanksgiving, when he hit and killed a woman pedestrian. The story was reported in the November 24, 1955 Los Angeles Times: "Stolen Hit-Run Auto Kills Woman / Driver Captured After Station Wagon Causes Truck To Crash And Ram Store". Mrs. Anita Taylor, 65 [she was actually 80], of 5213 Wadsworth Ave., was killed yesterday when struck by a stolen hit-and-run car that sped away only to cause another accident and crash into a store front. Mrs. Taylor was crossing the street at 52nd Place and Central Ave., when struck by the speeding car. The car, a stolen station wagon, continued at high speed to Vernon Ave., when it caused a truck driven by Alphonse Reeves, 23, of 10339 Juniper St., to swerve to avoid hitting the car and overturned. The station wagon, then out of control, plunged over the curb and into a shoe store at 4375 S Central Ave. The driver jumped from the crashed automobile and hailed a passing motorist with whom he drove away. Officers, who had been in pursuit, overtook the car and arrested Bruce Tate, 19, of 3755 Crawford Ave. He was booked on suspicion of manslaughter. The November 24 California Eagle splashed the incident across Page 1: "Hit-Run Car Thief Kills, Drags Mother Taylor, 80, On Central" (she'd been dragged about 200 feet after being hit). The article added this: "The suspect refused to talk when he was taken to Newton Street [Police Station]", although he was subsequently identified as Bruce Tate. "Police cars swooped down on him and surrounded him at 42nd and Hooper before he was able to make good his get-away." And: "According to police, the suspect saw the driver of the station wagon get out of the car at 55th and Central to go into the corner drugstore, leaving his keys in the ignition. Tate - if that is his name - jumped into the seat, stepped on the starter and zoomed away, stepping down on the gas to elude his pursuers." A preliminary hearing, meanwhile, was held Tuesday [November 28] in the case of the man accused of Mother Taylor's death as he made a mad dash down Central avenue in a stolen station wagon, running over the elderly woman, smashing into a truck at Central and Vernon, veering across the sidewalk into a shoestore, and then commandeering a passing automobile in an attempt to make his get-away. 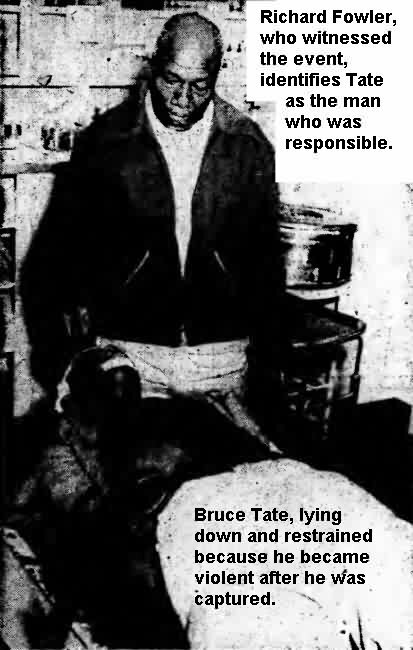 The man, Bruce Tate, 227 E. 56th street [note the totally different address from the other article], was accused of suspicion of hit-and-run manslaughter, when he was arrested a few minutes after he had turned the avenue into a shambles. He is being held in jail, on three counts - grand theft auto, hit and run, and manslaughter. Nothing else ever appeared in papers about the incident and I can't imagine that Bruce could have stayed out of jail. Up until his death in 1973, not a single additional word was ever written about him. A few days later, they did a Hunter Hancock show at L.A.'s Paramount Theater along with Dinah Washington, Big Jay McNeely, the Colts, the Platters, and Joe Houston. Of course, while they were in town, they got to appear on Hunter's Rhythm and Bluesville TV show. 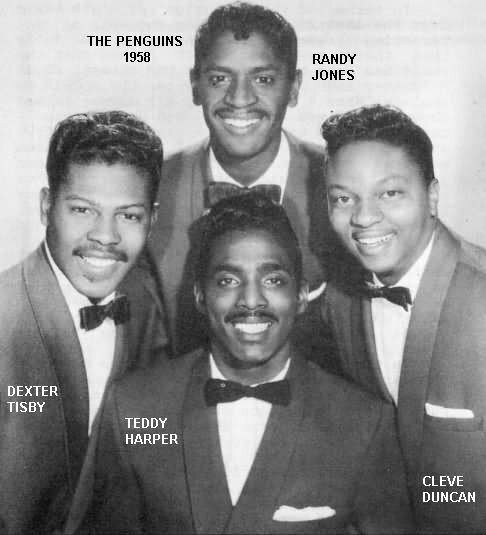 Busy the Penguins were: on November 25, they began another week at the Apollo Theater, this time with the Moonglows, Choker Campbell, Al Jackson, and the Collegians. As long as they were in the area, they played some odd venues. 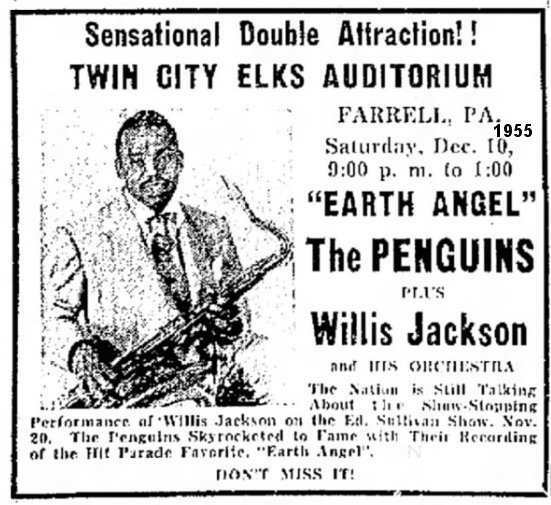 For example, on December 10, they (and Willis Jackson's Orchestra) appeared at the Twin City Elks Auditorium in Farrell, Pennsylvania. On Tuesday, December 13, the Penguins were on hand for the gala re-opening of Small's Paradise niteclub in Harlem, which had recently been purchased by Tommy "Dr. Jive" Smalls. (He was no relation to Edwin Smalls, who had originally owned it.) On hand for the festivities were Joe Davis (of Jay-Dee Records), Jerry Blaine (of Jubilee and Josie), Al Silver (of Herald and Ember), Hy & Sam Weiss (of Old Town), Ahmet Ertegun and Herb Abramson (of Atlantic and Atco), George Goldner (of Gee and Rama), Henry Glover (of King and Federal), and Hy Siegel (of Apollo). Other entertainers who just "happened" to drop by were Dean Barlow, the 4 Fellows, Buddy and Ella Johnson, the Prestos, the Solitaires, and Willis "Gator Tail" Jackson. Willie Mays and Roy Campanella were also present. In January 1956, Mercury released "My Troubles Are Not At An End" and "She's Gone Gone." They were reviewed the week of February 11, along with Ray Charles' "Drown In My Own Tears," the Colts' "Sweet Sixteen," the Sounds' "Sweet Sixteen," and the Wrens' "C'est La Vie." 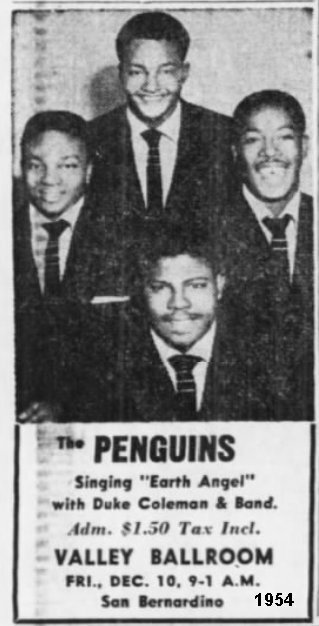 In late February, Mercury announced that from now on, all R&B talent would be shifted to their Wing subsidiary, whose A&R man would be the same Bob Shad who had signed the Penguins to Mercury. March 30th found them back in the studio to record "Dealer Of Dreams" (Cleve), "Ice" (Dexter), "Peace Of Mind" (Dexter), and "Cool Baby Cool" (Randy and Dexter). "Dealer Of Dreams" and "Peace Of Mind" were released, in April, on Wing (strangely, with Mercury's R&B policy, this would be the only Penguins record on Wing). Their last Mercury session took place sometime in June. It produced "Will You Be Mine" (Cleve), a re-make of "Earth Angel" (Cleve), and "The Sound Of Your Voice" (Curtis), a modern harmony number, which is so different from all other Penguins' tunes, that it's difficult to believe it's by the same group. Dexter says that they got the idea from the 3 Chuckles, with whom they appeared on some shows. From July 30 to August 5, the Penguins headlined the Casino Royal, in Washington, D.C. Then, it was on to the Civic Auditorium in San Bernardino (on the 10th) for a big "Rhythm In Blues (sic) Jubilee". They appeared along with the Colts and Marvin & Johnny's Orchestra. And then, in August, Buchanan and Goodman's "Flying Saucer" break-in novelty record (which had been released in July) hit the charts. Since "Earth Angel" was obliquely mentioned ("That was the Pelicans' outer space recording, 'Earth'"), it sparked new interest in the former hit. Dootsie was pressing and shipping the original as fast as he could, and, coincidentally, Mercury serendipitously had a brand-new recording of the tune: the re-sung "Earth Angel," backed with "Ice" was released in August. It was reviewed the week of September 1, along with Lavern Baker's "I Can't Love You Enough," the Vocaltones' "My Version Of Love," the Pyramids' "Okay Baby," and the Keynotes' "Now I Know." Also in August 1956, Dexter Tisby and Randy Jones briefly left, to be replaced by Teddy Harper (formerly of the Aladdins) and Alton Ray Brewster respectively. (Don't think, however, that the Penguins just grabbed people for replacements. 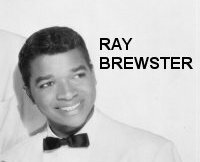 Ray Brewster signed a contract with Buck Ram, dated August 20, 1956.) I'm not sure what the line-up was when they played San Bernadino's Civic Auditorium on the 10th. On August 28th, the Penguins joined Alan Freed for his Second Annual Labor Day Show at the Brooklyn Paramount. With them were Fats Domino, the Teenagers, the Cleftones, the Harptones, Cirino & Bow Ties, the Shepherd Sisters, the Moonglows, and Mabel King. Following this, Buck Ram put together a show of his artists to do a Buffalo, NY telethon for Muscular Dystrophy. Hosted by Frank Ward of WWOL, the show also had Shirley Gunter, the Flairs, Young Jessie, Dolly Cooper, and Joe Houston's Orchestra. Within a couple of months of leaving, both Dexter Tisby and Randy Jones had returned, meaning that Teddy Harper and Ray Brewster were let go. Buck Ram would call on Teddy again at the end of 1957, while he used Ray as part of his re-formed Colts. Buck Ram put together another week-long show. Beginning December 4, the "Happy Music Show" played the Paramount in downtown Los Angeles. With the Penguins were the Platters, the Teen Queens, Nora Hayes, Gerald Wilson & his Ork., the Blockbusters, and Patti Ann Mesner. The Penguins' last Mercury record, "Will You Be Mine"/"Cool Baby Cool," was released in January 1957. There is no doubt that some of the Penguins' best work was done for Mercury, such as: "Be Mine Or Be A Fool," "Devil That I See," and "My Troubles Are Not At An End." (Both "Devil That I See" and "My Troubles Are Not At An End" sold well, but certainly were not in the big hit category.) Their contract stipulated that Mercury would release eight records a year; since this wasn't happening, Buck Ram claimed that Mercury had breached the contract and pulled the Penguins out. 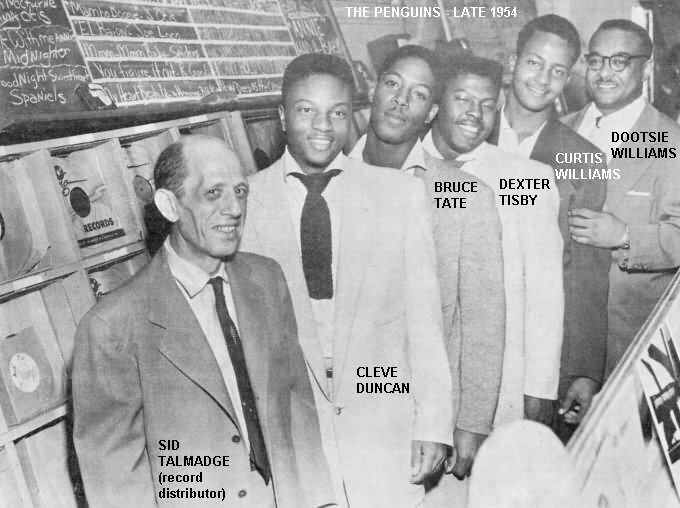 In March 1957, Atlantic Records announced that it had signed the Penguins. This was actually done on a trial basis, and it's probable that the songs were recorded independently by Ram (in Los Angeles), and then leased or sold to Atlantic. There were four masters: "Pledge Of Love" (Cleve), "I Knew I'd Fall In Love" (Dexter), "I'm Guilty Of Love" and "Dimpled Doll." Atlantic released "Pledge Of Love"/"I Knew I'd Fall In Love" that month. They were reviewed the week of April 13, along with the Midnighters' "In The Doorway Crying," the Cellos' "Rang Tang Ding Dong," the Schoolboys' "Mary," and the Tempo-Tones' "Get Yourself Another Fool." Although "Pledge Of Love" reached #15 on the R&B charts, the deal didn't work out for some reason. The Penguins and Ram parted company, the Penguins and Atlantic parted company, and the guys were broke. In mid-May, the "Earth Angel" lawsuits were finally settled, with Dootsie the winner. The court decided that Jesse Belvin was the full and exclusive author and that publication rights belonged to Dootsie Williams. Belvin promptly signed his rights over to Dootsie, whose name now appears as author of the song (talk about travesty). The only gray area was what was to happen to the ownership of the Mercury masters, since Curtis was found to be legally under contract to Dootsie at the time. While the resolution never made the trade papers, Mercury did retain the rights to all its masters. Dootsie re-released "Earth Angel" in July, probably to celebrate his victory. It became a hit in again in several areas, most notably San Francisco/Oakland, where (according to an ad) it was selected in KOBY's "Program Potency Test," and became the best-selling record in the Bay area. 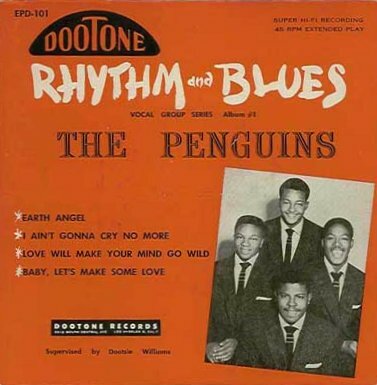 In the October 14, 1957, Billboard, it was announced that the Penguins had re-signed with Dootsie Williams, (whose Dootone Label was in the process of being re-named "Dooto"). Cleve said they felt that they were older and wiser than before, and could now get a better deal for themselves. Sometime in October the Penguins were part of an Art Laboe show in Long Beach. They shared the stage with Joe Houston, Big Jay McNeely, Marvin & Johnny, Don & Dewey, Johnny Flamingo, and that newcomer, Sam Cooke. Curtis Williams stayed for one more session, which produced "That's How Much I Need You" (Cleve) and "Be My Lovin' Baby" (Dexter). By December 1957, when those tunes were released, he had left to re-join the Hollywood Flames (he also left the state to avoid being jailed for non-support). As a replacement, Teddy Harper, who had been with them briefly in mid-1956, was once again recruited. 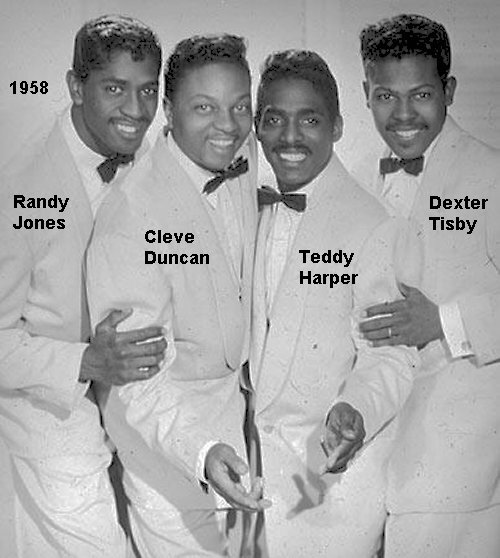 This group (Cleve Duncan, Dexter Tisby, Teddy Harper, and Randy Jones) recorded all the remaining Dooto sides. Dooto released "That's How Much I Need You"/"Be My Lovin' Baby" in December. They were reviewed the last week of the month, along with the Kuf-Linx's "So Tough" and the Rajahs' "Shifting Sands." Around the time that they returned to Dooto, Cleve had had his tonsils removed. Dootsie claimed that it affected his voice, but that's certainly a debatable point. The only certain thing is that they weren't having any hits. 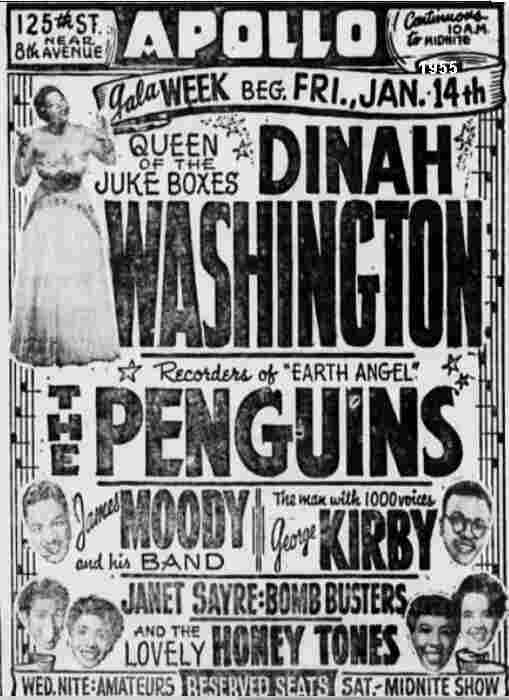 New Year's Eve 1957 found the Penguins as part of a Johnny Otis Rock 'N Roll Dance at the Civic Auditorium in San Bernardino. Others on the bill were Mel Williams, Marie Adams and the 3 Tons Of Joy, Little Arthur Matthews, Jackie Kelso, Julie Stevens, Jimmy Nolen, and Willie Mae "Big Mama" "Thornton. There were more sessions, but it becomes impossible to chronicle what was recorded when. 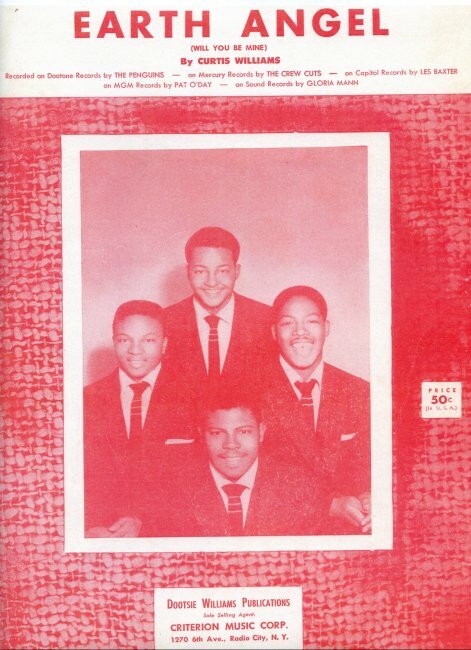 "Let Me Make Up Your Mind" (Cleve)/ "Sweet Love" (Teddy) were released in January of 1958. "Do Not Pretend" (Dexter)/"If You're Mine" (Randy) were released in March, 1958. Once again, the sides failed to chart. 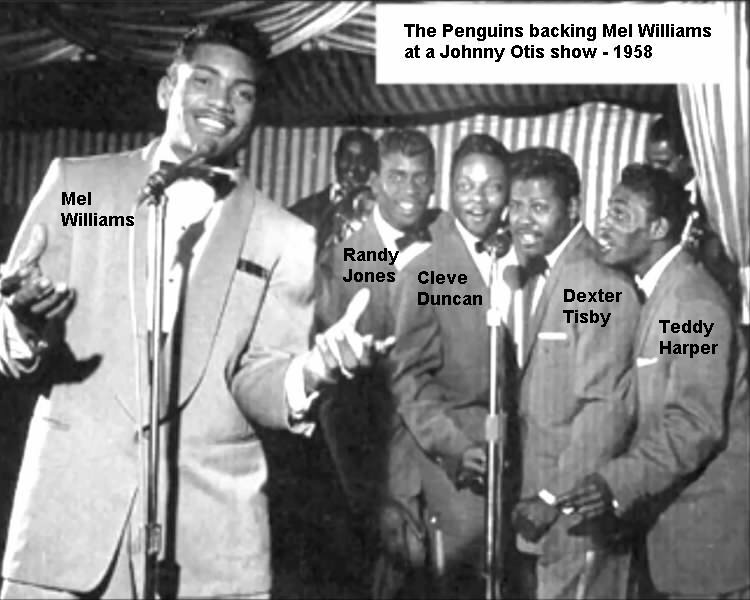 Also in March, the Penguins were present at the Club Oasis, for a special presentation to Redd Foxx (who, with his raunchy comedy albums on Dooto, probably outsold all of Dootsie's groups combined). Also present were Sammy Davis, Jr., Lavern Baker, the Fortunes, Slappy White, and the Cuff Linx. All other known sides were issued on an album (The Cool, Cool Penguins), issued around March: "Want Me" (Cleve), "Cold Heart" (Teddy), "Money Talks" (Randy), "Lover Or Fool" (Cleve), "Butterball" (a Randy and Dexter duet lead), and "Heart Of A Fool" (Randy). They were also issued on various EPs. In spite of this, on April 18, the Penguins appeared with Otis at the Civic Auditorium in San Bernardino. Also on the show were Otis regulars Mel Williams, Marie Adams & the 3 Tons Of Joy, and Little Arthur Matthews. They were joined by Bobby Day, Don & Dewey, Googie Rene, the Cuff Links, Jeannie Mack, and Bobby Lee Trammel. On June 27th, the Penguins appeared at Hunter Hancock's Record Hop at Jordan High School. They'd come full circle. From record hop appearances to headlining major shows to record hop appearances. The Penguins' days as a force in music were ended. There were no new releases on Dooto for about two and a half years. The Penguins had just about waddled off into history. My feeling is that they were mostly dormant until 1962, although, according to Cleve, they never broke up. In December 1958, Dootsie re-released "Earth Angel" again. It was soon reported doing well on the East Coast (Dootsie was still advertising it in trade paper ads in February 1959). A strange item from January 1959 concerned an announcement from Len Levy of Hanover Records in New York. He claimed that he'd signed "Curtis Williams and the Penguins" (described as "long dormant") to his label. Since nothing was ever released and Curtis was singing with the Hollywood Flames at this point, I have no idea what to make of the announcement. (Hanover was located in Manhattan and the Hollywood Flames had relocated to New York by this time, so it might have been a failed attempt to get the Flames recording under another name.) Another announcement from January came from Dootsie. He said that "Earth Angel" was doing so well that he'd booked the Penguins on a tour of Australia. Did they ever go? I have no idea. This is the last mention of them I can find in the 50s. 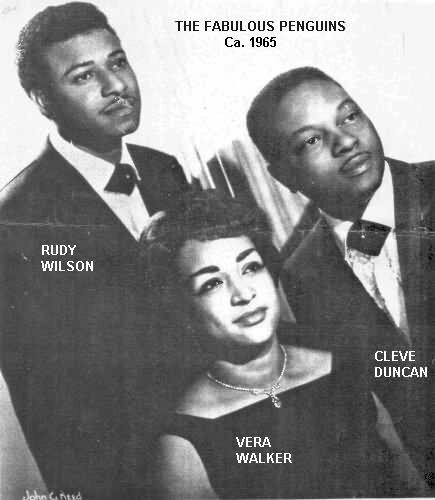 In case you wonder what Cleve was doing in the interim, there was a 1959 Dooto release called "To Keep Our Love"/"I'm Betting My Heart" by Cleve Duncan and the Radiants -- this was Cleve with sisters Vesta and Evelyn King, and someone remembered only as "Johnny." The last week of December, 1959, "Earth Angel" once again made the charts. Well, kind of; it reached #101. However, that's not bad for a five-year-old song. But why was it on the charts at all? It was riding the revival wave started by Art Laboe (KPOP), when he issued his first "Oldies But Goodies" album. (He broadcast from a drive-in restaurant in L.A., where customers could request their favorites from the comfort of their cars. Incidentally, this was the first album which featured songs from more than a single record company). Once again, Dootsie saw an opportunity and re-released the song. The last Dooto issue was "You're An Angel" and "Mr. Junkman" (both led by Cleve). They were released on an EP (backed with two Medallions sides) in April 1960. Were they older masters or current ones? Once again, I have no idea. 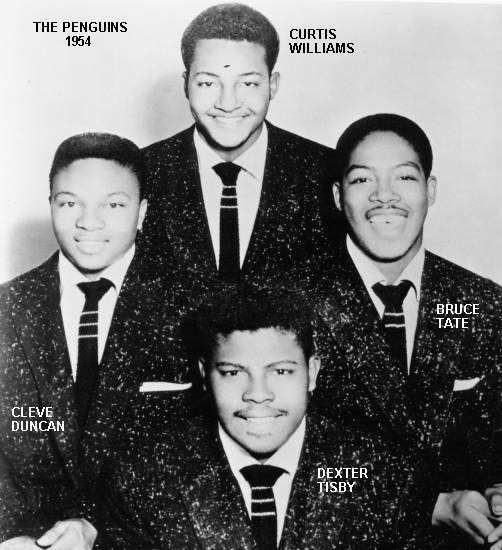 They finally broke with Dootsie Williams in 1960, and continued performing for another two years. 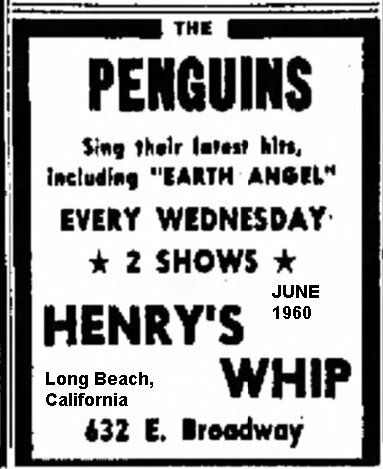 An advertisement from June 1960 indicated that the Penguins were regulars at a place called Henry's Whip in Long Beach, California. They'd do two shows each Wednesday. 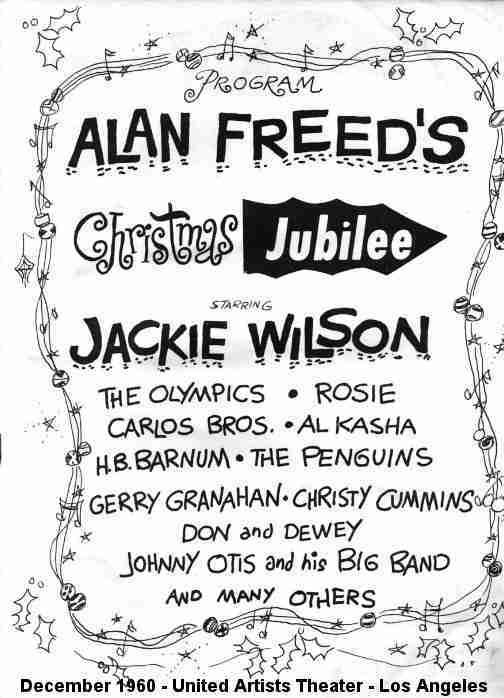 In December 1960, the Penguins were part of a little-known Alan Freed show, probably the last in his "Christmas Jubilee" series. By now, Freed was a DJ on KDAY in Santa Monica, California. Held at the United Artists Theater in Los Angeles, all the acts, with the exception of Jackie Wilson and Gerry Granahan, were from California: the Olympics, Johnny Otis, H.B. Barnum, Don & Dewey, the Carlos Brothers, Al Kasha, Rosie Hamlin, and Christy Cummins. 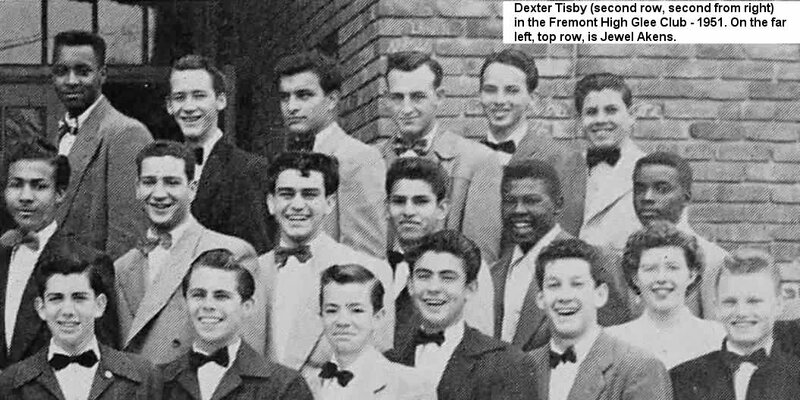 On April 7, 1961, the Penguins, the Meadowlarks, and Jimmy Norman appeared at a dance held in the gym of Norwalk High School (Long Beach, California). The MC was KRLA's Roy Elwell. There was a late 1961 release on Johnny Otis' Eldo label, credited to the Penguins, called "To Keep Our Love"/"Universal Twist." However, the top side is actually the Radiants cut and the flip was the only Penguins song that Cleve didn't remember. I have in my notes that it could be something that Johnny Otis and H.B. Barnum put together, but I have no memory of why I wrote that. It could very well have been that Teddy Harper or Dexter Tisby recorded the song and the Radiants number was put on the back to give it some "legitimacy" as a Penguins tune. I played the song for Ray Brewster, and he thinks it's Teddy Harper leading. The Penguins' final recording was "Believe Me"/"The Pony Rock," done for Sun State records in 1962. The group was still intact (but just barely): Cleve, Dexter, Teddy, and Randy. After this, the Penguins disintegrated. By the following year, Dexter, Teddy, and Randy had joined with Cornell Gunter to become the first of his Coasters groups; Teddy was still with him in 1972. Probably to counter the Sun State recordings, Dootsie Williams re-released "Earth Angel" around May of 1962. A June ad has it "breaking out again." In August 1963, Dootsie complained that there were thousands of counterfeit copies of "Earth Angel" floating around. So many, in fact, that he offered a $10,000 reward for information leading to an arrest. The second Original Sound release was in 1965: "Heavenly Angel"/"Big Bobo's Party." This had Cleve, Walter Saulsberry, the King Sisters (Vesta and Evelyn, from the Radiants), and Vera Walker. While the hits stopped long ago, Cleve Duncan kept the Penguins name alive down through the years. 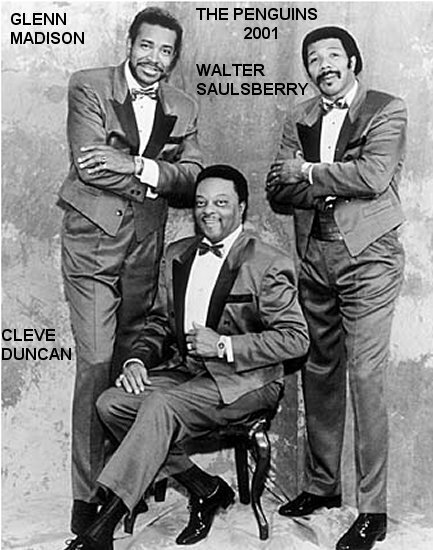 In the mid-60s, Cleve formed the Fabulous Penguins, which first consisted of Rudy Wilson and Vera Walker. 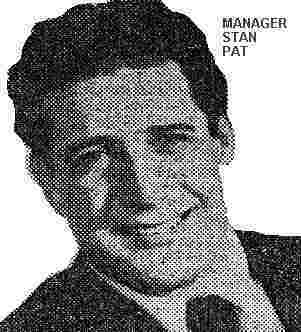 Stan Pat, a former DJ who had been the manager of the Dreams, the Castelles, Gloria Lynn, Eunice Davis, the Delltones, and Screamin' Jay Hawkins, became the Penguins' manager in late 1967. 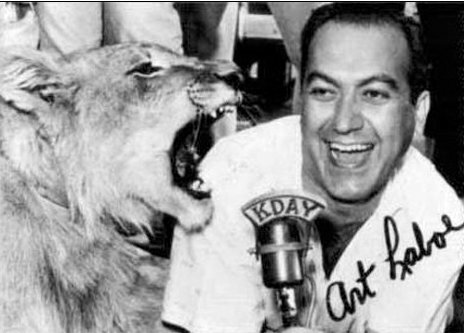 In 1984, Art Laboe re-released "Memories Of El Monte" and "Heavenly Angel" on his Original Sound OBG series (Oldies But Goodies). The following year saw two more Penguins releases on that label: "Crying In The Chapel" and "Your Tender Lips" (the flips were by different artists). These two songs, only seem to have Cleve's voice, although both are credited to the Penguins. ("Your Tender Lips" is the 1956 Clovers song.) It's hard to say when these were recorded: the background for "Chapel" has no special sound to link it to a date, but "Lips" has a heavy bass line that probably means it was cut in the 80s. Although they recorded almost 50 sides in an 8-year career, the Penguins have been remembered for just a single one; but what a one! It still remains as a lasting tribute to one of the finest West Coast groups. On November 6, 2012, Cleve Duncan died, after just having voted; he was 78. Cleve has left the Earth to sing as an Angel, but we had him for a wonderful while. Special thanks to George Moonoogian, Galen Gart, and Richard Carpenter.